How Mobile Money Payment System Works? HOME : Mobile Money - How it works? Check out the detailed process flow exclusively prepared by Neowave, the first to integrate Mobile Money Weblink into its shopping cart software. It will show you how a customer buy and pay using Mobile Money from an e-commerce website powered by webShaper e-commerce software. Check out the screen shots* section NOW! * The showcase is a real working example of a demo store. With approval from www.suijewelry.com, we utilize their website design for illustration purpose ONLY. For a detailed Mobile Money Payment System Process Flow, please download the PDF File below. You'll need Adobe Acrobat Reader to view the form. If you don't have this software, you can download it for free. 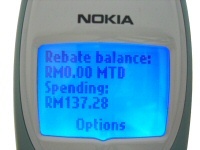 Customer choose to pay via Mobile Money for the goods and services from participating merchants. Customer gives merchant his/her mobile number via phone, fax, email etc. 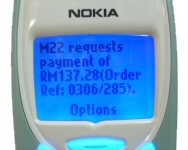 P1.1: Customer Receiving Payment Request via SMS from Merchant. 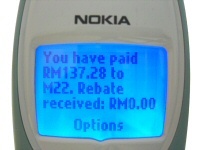 Screen 1 and 2 are showing messages from 1 SMS Only. Mobile Money authenticates customer's SECURITY PIN and requests for bank approval on transaction. 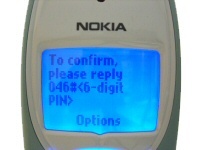 P1.2: Customer Replying the SMS with their PIN CODE. P1.3: Customer Receiving Notification from Mobile Money. Merchant can deliver the goods / services.